NOTE: THIS IS NOT AN APRIL FOOL’S DAY PRANK. THIS IS A REAL THING. PAY NO ATTENTION TO THE COINCIDENTAL DATE. Today is also the anniversary of the Evil League of Evil Writers. Long story. Read on. BEHOLD! IT HAS BEGUN! 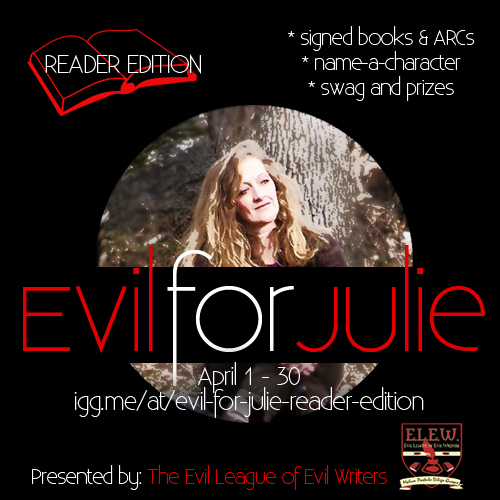 EVIL FOR JULIE LIVES! (We’re having some minor issues getting the Paypal account accepted, but we’ll deal with that in the morning. For right now, it’s credit cards. No worries! We have the whole month!) We’re good now! Carry on! On Sunday March 23, Julie Butcher’s husband had an accident around the home involving a chainsaw and his leg a grizzly bear that he fought off with his bare hands*. Mr. Julie is, thankfully, fine. But this is a family with six kids now facing skyrocketing medical costs. Costs WE can help with. If everyone gives a little, it can add up to a lot. This, obviously, seems like a job for the Evil League of Evil Writers to do some fundraising. *It was a chainsaw but apparently fighting grizzly bears sounds less embarrassing. In a nutshell, we need money. Well, Julie and her mister do: he’s already had a couple of surgeries, and a nurse is required for home visits to help. End of the world insurance is covering some costs but not all, and this is a very large family facing a sudden influx of extra expenses. We at the Evil League of Evil Writers aren’t big on handouts; we want your assistance, but we want to offer you stuff in exchange for it. Note: There are two campaigns – the Reader Edition and the Writer Edition. Each has different perks based on if something would apply to a reader or a writer. Because if you’re not a writer, what would you do with a 50 page critique of a manuscript? I mean, there’s no stopping you from donating for that perk if that’s what you want to do, but…hey, your eccentricities are your business! All of the money–less the fees from Indiegogo and PayPal–go directly to Julie and her family, and will help with medical and living costs during this difficult time. We picked $3500 as a goal for the reader campaign and $1500 for the other to hit $5000 total as that was what we managed to raise for last year’s fundraiser, but it is in no way final. If more comes in, all will be able to be put to use by the family. Julie Butcher lives with her husband and six children on the fringes of Utter Chaos. The sister of #1 New York Times bestselling author Jim Butcher, who she adores, she writes because her sister-in-law said it was time to learn, and Julie doesn’t argue with women who own guns. Her super-powers involve sugar and ninjas and will be revealed on a need-to-know basis. She is a contributor to BuzzyMag.com and huge supporter of the writing community. When not writing, she’s inspiring others by volunteering at a local food pantry. Seriously, you guys, Julie is so much more awesome than the rest of us, but now is your chance to be almost as cool yourself and help out. This fundraiser was started by the Evil League of Evil Writers to support our beloved Senior Pie Coordinator and Clubhouse Keeper during a time of need. It is our second large-scale fundraiser as a group, the previous being 2013’s Evil for Crestline Auction. Everything we do is evil, including online fundraising. Aren’t Charitable Endeavors Inherently Good? Of course not. Have you MET Julie Butcher? The woman is capable of the most terrifying Scary Mom Eyes known to humankind. She is pure evil, and the less she worries about money right now, the more time she has to continue terrorizing writers with her eviltry. Also, by supporting Julie’s family, it might make them cry happy tears. Making people cry is of course evil. As a friend said, when the universe kicks one of us, we kick back twice as hard. And we invite you to be bad guys and kick back with us. If you can’t give money, and robbing a bank is still illegal where you live, please help get the word out the fundraiser. Tweet, Pin, Facebook, Tumbl, blog, skywrite, sacrifice virgins to the dark ones in order to boost the campaign power: whatever it takes. The response to this fundraiser has been beyond our wildest expectations, with over 100 donations and counting. Indiegogo only allows us to offer twenty at a time, so don’t be surprised if you don’t see yours offered. Once a perk is taken, we’ll replace it with another. This fundraiser is going throughout the month of April, so it might be a little bit before it’s up for grabs. Stay tuned! So there you have it! Now go! Go and be evil! Bring the pain! Make it rain with their tears! BWAH-HA-HA-HA-HA!